I find few things more fascinating than remote fixes to distant spacecraft. We’ve used them surprisingly often, an outstanding case in point being the Galileo mission to Jupiter, launched in 1989. The failure of the craft’s high-gain antenna demanded that controllers maximize what they had left, using the low-gain antenna along with data compression and receiver upgrades on Earth to perform outstanding science. Galileo’s four-track tape recorder, critical for storing data for later playback, also caused problems that required study and intervention from the ground. But as we saw yesterday, Galileo was hardly the first spacecraft to run into difficulties. The K2 mission, reviving Kepler by using sophisticated computer algorithms and photon pressure from the Sun, is a story in progress, with the discovery of super-Earth HIP 116454 b its first success. Or think all the way back to Mariner 10, launched in 1973 and afflicted with problems including flaking paint that caused its star-tracker to lose its lock on the guide star Canopus. The result: A long roll that burned hydrazine as thrusters tried to compensate for the motion. Controllers were able to use the pressure of solar photons on the spacecraft’s solar panels to create the torque necessary to counter the roll and re-acquire the necessary control. The Messenger spacecraft also used pressure from solar photons as part of needed course adjustment on the way to Mercury, and now comes news of yet another inspired fix involving the same craft. Messenger was on course to impact Mercury’s surface by the end of March, 2015, having in the course of its four years in Mercury orbit (and six previous years enroute) used up most of its propellant. But controllers will now use pressurization gas in the spacecraft’s propulsion system to raise Messenger’s orbit enough to allow another month of operation. 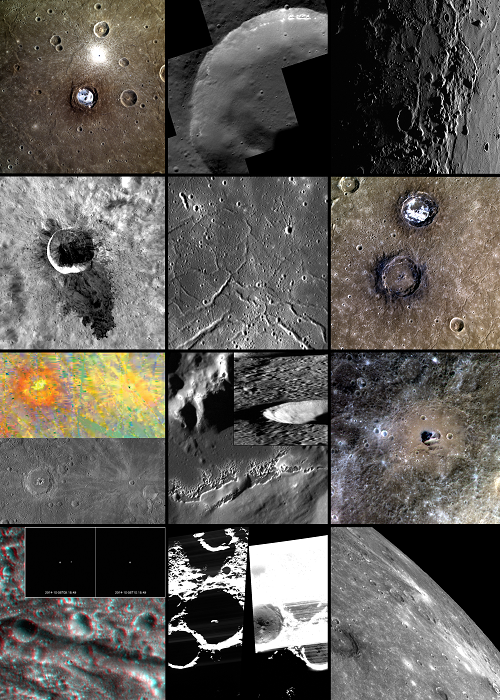 Image: A compilation of Messenger images from Mercury in 2014. Next April, Messenger’s operational mission will come to an end, as the spacecraft depletes its fuel and impacts the surface. However, the last few months of operations should be rich, including science data obtained closer to the planet’s surface than ever previously accomplished. Credit: JHU/APL. So we gain an extra month to add to Messenger’s already impressive data on the closest planet to the Sun. The spacecraft’s most recent studies, begun this past summer, have involved a low altitude observation campaign looking for volcanic flow fronts, small scale tectonic effects, layering in crater walls and other features explained in this JHU/APL news release. Growing out of this effort will be the highest resolution images ever obtained of Mercury’s surface. The additional month of operations will allow a closer look at Mercury’s magnetic field. “During the additional period of operations, up to four weeks, MESSENGER will measure variations in Mercury’s internal magnetic field at shorter horizontal scales than ever before, scales comparable to the anticipated periapsis altitude between 7 km and 15 km above the planetary surface,” says APL’s Haje Korth, the instrument scientist for the Magnetometer. Korth also says that at these lower altitudes, Messenger’s Neutron Spectrometer will be able to resolve water ice deposits inside individual impact craters at the high northern latitudes of the planet. That’s a useful outcome and it grows out of sheer ingenuity in using existing resources. What’s fascinating in all these stories is that when we send a spacecraft out, we have frozen its technology level while our own continues to expand and accelerate. Think of the Voyagers, still operational after their 1977 launches, and imagine the kind of components we would use to build them today. The trick in resolving spacecraft problems and extending their missions is to keep the interface between our latest technology and their older tools as robust as possible. That involves, it’s clear, not just hardware and software, but the power of the human imagination. One lesson is that flexibility is invaluable. Software updates are one mechanism. But adapting components for multi-functionality is another, as the use of pressurized helium as a low efficiency thruster demonstrates. Our level of technology is still primitive. We seen a machine as a designed artifact, more or less static in form once completed. But advanced technology may be a lot more malleable than that. If our technology could physically transform in response to demands, it would vastly increase its flexibility and capability. Coming into view is 3-D printing. We can envisage craft consuming their structure and printing new components as needed, analogously to the Von Neumann probes, but without external resources. New designs and components could be uploaded long after the spacecraft has left Earth. For machines with access to resources, e.g. a Mars rover, I could imagine printing out new scientific instruments as needed and leaving them at various way points, or printing copies of the rover to expand the ground coverage, increasing redundancy via the model of “fast, cheap and out of control”. Perhaps ultimately machines may become like the T-1000 in Terminator 2: Judgment Day – infinitely transformable. In the intermediate future, I see self-repair as important. When we had discussions about erosion of sails in interstellar space, there was no suggestion of self-repair of the sail to compensate. All living things self-repair to extend their longevity. As our technology matures, I expect the same sort of approach to extend the “life” of our deep space craft. In the nearer term, crewed spacecraft could use similar principles of multi-functionality and in situ manufacturing to ensure high reliability and repair of the craft. The 3-D printing experiments on the ISS are an indicator of where this may eventually lead. will die by orbital decay. It orbits the planet with the feeblest trace of an atmosphere. But it is apparently too close at it’s closest approach, which seems to be price paid for such detailed photos it sent of Mercury’s surface. spacecraft was up to it, Could it not be put into higher STABLE orbit? A great subject — don’t forget the Huygens lander comm flaw. Alex: 3D printing is fascinating, but it can provide only a small part of the solution. In-situ resource utilization requires many chemical processes, some of which are not at all easy to miniaturize. Any (self-) replicating craft arriving at a natural planet or asteroid would have to bring equipment for every one of the processes necessary to mine and refine the materials that new parts would be made out of. Self-cannibalization, as you describe, should be somewhat easier, and the easiest is to bring a store of readily printable/formable material along. @Eniac – I agree with you that3D printing isn’t likely to be the full solution. But it is early days and I think the technology will become far more powerful with time. I personally think swarms of redundant, miniaturized probes are the best way to handle failures today, but all these technologies are advancing rapidly so who knows what the best solution will be in 25 years or so. But it is early days and I think the technology will become far more powerful with time. That is true, and exciting. However, even the most advanced 3d-printer would probably not be able to operate with chunks of rock picked up from an asteroid. And the parts it produces would still need to be assembled into a functional system. Broadly, there are three essential functions of an autonomous self-replicating machine: 1) mining and refinement of materials, 2) forming of parts, and 3) assembly of systems. 3D-printing is an excellent candidate to address the second area, but it is unlikely to cover any of the others, which are arguably more difficult. There are many alternatives to 3D-printing: If machines were designed to be assembled from a limited repertoire of versatile parts (like Lego bricks, perhaps), forming the parts could be done more efficiently by molding rather than 3D-printing. Other versatile options exist, such as casting, cutting and bending of sheet metal, or conventional machining. All these have in common that they require only relatively simple tools, eliminating the need for a 3D-printer as one of the systems that need to be assembled. This could be worth a lot. In my view, the one really critical component of a replicator is the manipulator, a device that can assemble other devices. It is obviously necessary for function 3) above, but it can also perform a lot of the activities of functions 1) and 2), given an appropriate arsenal of tools. For example, a manipulator with a chisel could carve just about any desired shape out of naturally occurring rock. A chisel is considerably easier to come by than a 3D-printer. In general, redundancy in numbers is good, but it reaches a point of no return quickly, at very low numbers. For example, if you send a swarm of a million, and half of them fail every year, it will be only 20 years until the last one dies. On the other hand, if you can make them last 5 years, you need to send only 16 to have a good chance of one coming through, in the same amount of time. Self-replication transcends this equation and can make a device last for eternity.